Politicians are usually seen as fair game for criticism especially if they talk about the inconvenient details of climate change. If only they would stick to the simplicities and repeat the mantra that climate change is real and happening and we are entirely to blame. Woe betide any politician who delves into the detail. Usually we like our politicians to get down amongst the minutiae of government, but not when it comes to climate change. Despite the vigorous debate about the hiatus in the peer-reviewed literature this was seen by some as such an incorrect statement that a response had to be made, and fast. Ben Santer of the Lawrence Livermore National Laboratory was quick off the mark putting together a paper for the journal Nature Scientific Reports. It looked at satellite measurements of the temperature of the atmosphere close to the ground from when such data first became available in 1979. It concluded: Satellite temperature measurements do not support the recent claim of a “leveling off of warming” over the past two decades. Tropospheric warming trends over recent 20-year periods, the authors concluded, are always significantly larger (at the 10% level or better) than model estimates of 20-year trends arising from natural internal variability. 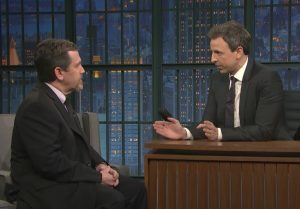 Ben Santer on the Seth Myers Show. The Nature Scientific Reports paper was submitted on 6th March, accepted on the 4th of April and published on the 24th May. But as that paper, with its simple message that Pruitt was wrong, was being written another paper on the same topic and also involving Santer was already in the works. It had been submitted three months before, on the 23rd of December the previous year. In other words the climate models have failed. They did not predict and they cannot explain the hiatus. To reach this conclusion the Nature Geoscience paper analysed trends in the satellite data over 10, 12, 14, 16 and 18 years because the researchers said that they are typical record lengths used for the study of the ‘warming slowdown’ in the early 21st century. Note they did not analyse trends over 20 years directly. Thus the first Santer et al paper analysed the past 20 years and concluded there was no hiatus, while his second paper concluded there was a hiatus of up to 18 years, the maximum period that paper studied. The authors realised the problem of the two papers seemingly conflicting results. To avoid any confusion they issued a helpful Q&A document saying the results were not contradictory but complimentary. It must be said that two methods they used are only very slightly different. On would expect them to give the same result. But that does not matter. If as the authors say the results are complimentary why was the result that disagreed with Pruitt used with no qualification or hint that a similar technique showed the opposite? On the 22nd February Ben Santer on appeared on the Seth Meyers chat show saying these are strange and unusual times, something that with hindsight is laced with irony. He was introduced as being from the Lawrence Livermore National Laboratory but stated he was talking as a private citizen about research he had done and published on behalf of the Program for Climate Model Diagnosis and Intercomparison at the Lawrence Livermore National Laboratory. U.S. 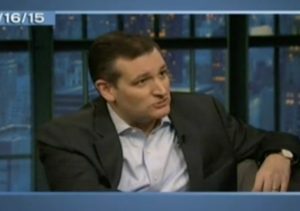 Senator Ted Cruz on the Seth Myers Show in March 2015.